I recently spied this cool Silhouette design in the Silhouette Online Store. Now that all the designs are 50% off until Nov 30th, I decided to download several. Today we had an impromptu birthday celebration at school for my friend, Judy. I made this card for her. The cardstock is from Stampin' Up and the rhinestones are from Michael's. Thanks for stopping by...especially, my sweet blogging friend, Amy, who always manages go leave a kind word. Woman, you were up in the middle of the night just like me! I love Instagram! It's got to be my favorite app on my iPhone. Last month, Kalino went to a birthday party for Lillie, my friend Nadja's daughter. A while back, Nadja posted an awesome photo of Lillie dressed as an Jedi. I love girls that love Star Wars. 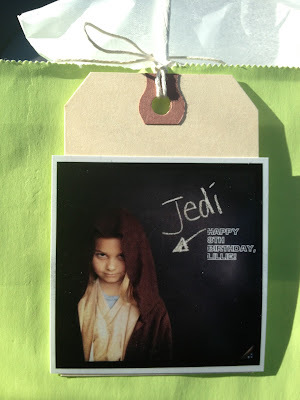 I loved the photo so much, I used it to make the tag for her gift bag. I love that Nadja has a chalkboard wall in her house. I didn't add "Jedi" and the arrow, that was on their wall. I wish I had a chalkboard wall. So cool! I used the editing tools in Picasa to add the Happy Birthday text. Before I could add any text, I had to "erase" their light switches in the photo because it was right where I wanted to put the happy birthday sentiment. I downloaded a free Star Wars font. I glued the photo onto a plain shipping tag and I was done. Very simple! Thanks for stopping by.